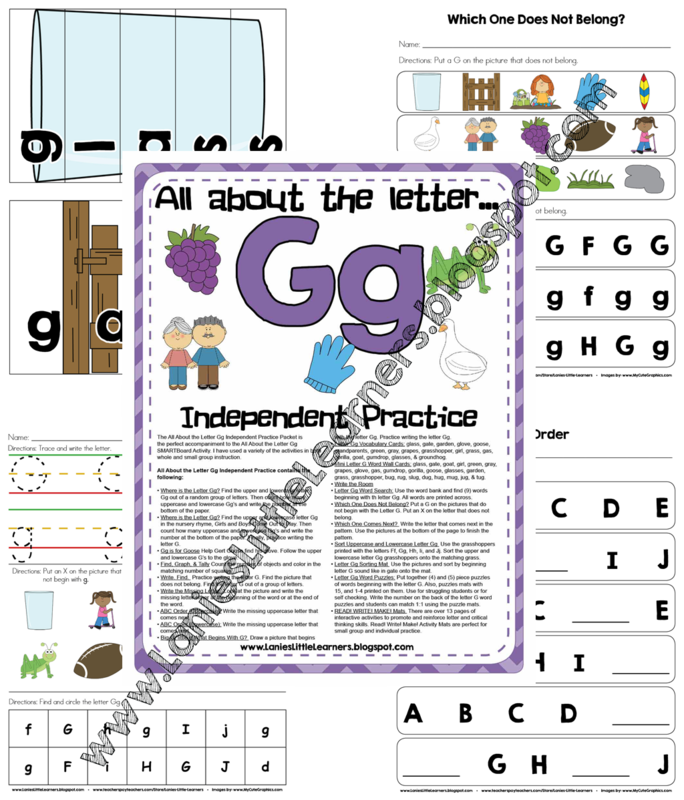 The All About the Letter Gg Independent Practice Packet is the perfect accompaniment to the All About the Letter Gg SMARTBoard Activity. I have used a variety of the activities in both whole and small group instruction. Where is the Letter Gg? Find the upper and lowercase letter Gg out of a random group of letters. Then count how many uppercase and lowercase Gg’s and write the number at the bottom of the paper. Where is the Letter Gg? Find the upper and lowercase letter Gg in the nursery rhyme, Girls and Boys Come Out to Play. Then count how many uppercase and lowercase Gg’s and write the number at the bottom of the paper. Finally, practice writing the letter G.
Gg is for Goose Help Gert Goose find his glove. Follow the upper and lowercase G’s to the glove. Write. Find. Practice writing the letter G. Find the picture that does not belong. Find the letter G out of a group of letters. Write the Missing Letter: Look at the picture and write the missing letter either at the beginning of the word or at the end of the word. ABC Order (Uppercase): Write the missing uppercase letter that comes next. ABC Order (Lowercase): Write the missing uppercase letter that comes next. Big G, little g What Begins With G? Draw a picture that begins with the letter Gg. Practice writing the letter Gg. Letter Gg Vocabulary Cards: glass, gate, garden, glove, goose, grandparents, green, gray, grapes, grasshopper, girl, grass, gas, gorilla, goat, gumdrop, glasses, & groundhog. Mini Letter G Word Wall Cards: glass, gate, goat, girl, green, gray, grapes, glove, gas, gumdrop, gorilla, goose, glasses, garden, grass, grasshopper, bug, rug, slug, dug, hug, mug, jug, & tug. Letter Gg Word Search: Use the word bank and find (9) words beginning with th letter Gg. All words are printed across. Which One Does Not Belong? Put a G on the pictures that do not begin with the Letter G. Put an X on the letter that does not belong. Sort Uppercase and Lowercase Letter Gg Use the grasshoppers printed with the letters Ff, Gg, Hh, Ii, and Jj. Sort the upper and lowercase letter Gg grasshoppers onto the matching grass. Letter Gg Sorting Mat Use the pictures and sort by beginning letter G sound like in gate onto the mat. Letter Gg Word Puzzles: Put together (4) and (5) piece puzzles of words beginning with the letter G. Also, puzzles mats with 15, and 1-4 printed on them. Use for struggling students or for self checking. Write the number on the back of the letter G word puzzles and students can match 1:1 using the puzzle mats. READ! WRITE! MAKE! Mats There are over 13 pages of interactive activities to promote and reinforce letter and critical thinking skills. Read! Write! Make! Activity Mats are perfect for small group and individual practice. Directions: Print Letter G Vocabulary Cards, Mini Word Wall, Sort Uppercase and Lowercase Letter F, Letter Ff Sorting Mat, Letter Gg Word Puzzles, and READ! WRITE! BUILD! Mats on cardstock and laminate for durability. CLL1.4a Demonstrates eagerness to learn about and discuss new topics, ideas and tasks.